Have you ever wanted to make something from clay but haven't because the thought of having to find a kiln for glazing and firing seemed a tad too hard? Me too. I had played around with air-dried clay before with my kids, making little Christmas ornaments and whatever they wanted to make - snakes, gingerbread men, unidentifiable objects, but never really took it seriously ... until the other day. I bought some of this air-dried clay from Spotlight the other week with the intention of letting the kids play with it again and create whatever they wanted. While they were making snakes (again), shapes and unidentifiable objects (again) and I was sitting beside them getting a bit restless, I made some little clay gifts tags. I rolled some doily fabric over the clay which made a really pretty impression. I was a little bit smitten with my tags. Then I got a fraction excited. I would have a go at making some small bowls, with the pretty impression. So that's what I did - and the best bit was it was really, really easy. Hoorah. I rolled out a chunk of clay and laid the doily fabric over the top. I rolled again, a few times - not too hard but just firm enough to get a good imprint. I placed a small bowl over the clay and cut around it with a knife. 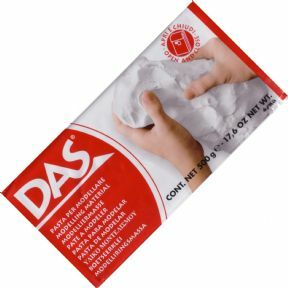 I lifted the clay off the baking paper and placed it gently inside the bowl. Then it gets left to dry, overnight, or longer (I left mine two days). Once it's dry it shrinks a tiny bit so it just falls out of the bowl. Ohhhhhhh, this is the exciting bit because out pops a perfectly (or imperfectly as hand-made is) formed little bowl. I then lightly sanded the rim of the bowl, using a fine sandpaper, to get rid of any rough or lumpy bits. And that's it. No firing, no glazing, no kiln required. A walk in the park. Gave them a coat of white paint. The clay is white and can be left that way but I just wanted it to be white-white not grey-white. 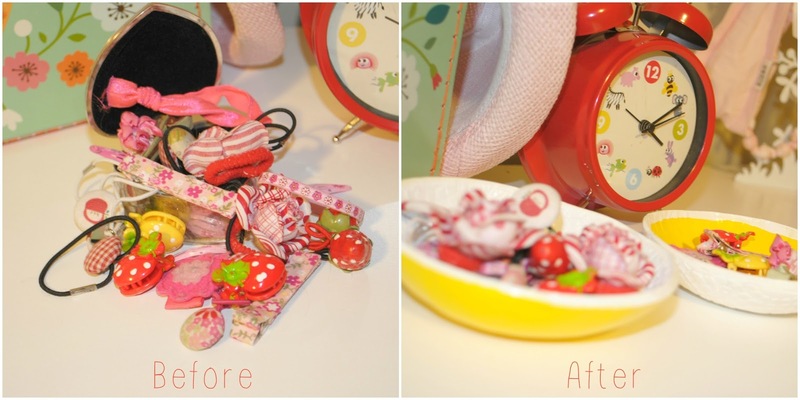 I decided to use both bowls in my little girl's room for her growing collection of hair-ties and clips so I wanted to brighten them up a bit. I painted one yellow on the outside and one yellow on the inside. I also finished them off with a gloss varnish (I used Jo Sonja's Gloss Varnish but you could probably use any water-based varnish). Squeal!!! I love it when an idea turns into super-cuteness reality! What do you think? I really like them, totally love the pattern thing, and I'm pretty sure I have found a new addiction (oh dear). I still have half my packet of clay left so I will definitely be making some more. I might even have a go at making some small plates or even tinier vessels for holding things like paper-clips, pins, craft supplies etc. 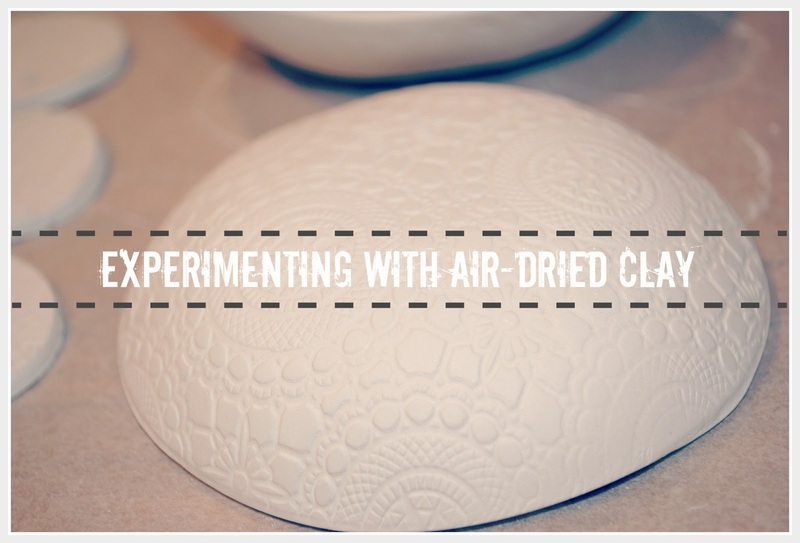 What I love about the air-dried clay is its versatility and that it's so accessible and easy for everyone to use. You don't have to be creative to use it - just have a play and see what happens. If you don't like what you've made, squash it, roll it out again and try something else. Try pressing the clay with different patterns, shapes or objects ... grab a leaf and see what that does, or something out of the kitchen drawer, or the Tupperware cupboard. Just have a go. It's therapy, I tell you! My youngest Miss 12 has been working with this clay after a meet and greet with a jewellery designer so I'm going to have to show her this post and invest in a truck load of clay before the next school holiday. Just love this post and your blog. Thanks so much for linking up for the Mystery Case Sharing is Caring Sunday. Looking forward to 'casing' your blog further. Wow! what a piece of art and craft! It's just a simple dried plate clay but after putting some color with it, it looks really beautiful.. Nice craft! Any ideas on what might have gone wrong?